The menu has certainly changed since our last visit with new, seasonal options, along with a special section for healthier options – all of which come in at under 500 calories. A new set menu is competitively priced (£8 for one course, £11 for two or £14 for three), with the option of a bottle of house wine at just £10. 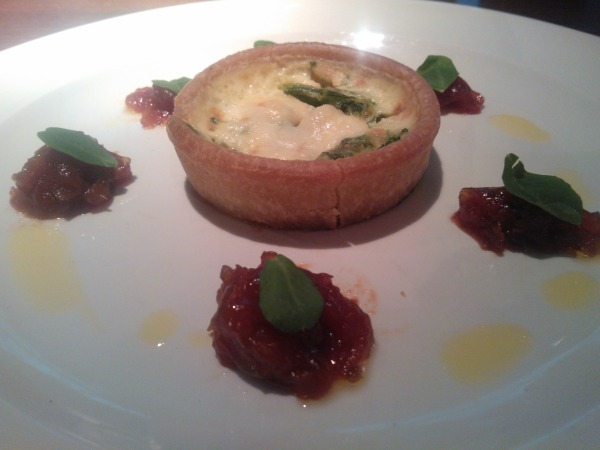 For my starter, I opted for one of the new dishes from the menu: the Tenderstem broccoli, pea and pesto tart with tomato chutney (£5.25). The presentation was beautiful, the tart itself starting with a layer of peas, and with a quiche-like consistency above, with small pieces of broccoli on the top. There was just enough pesto drizzled throughout to flavour but not overpower the tart, and the sweet tomato chutney was beautiful. Sadly the pastry was a little over-moist, however, which was a shame. My dining companion ordered the beer battered tiger prawns (£7.25), served on a bed of lettuce and with a wasabi mayonnaise and a sweet chilli sauce. The prawns themselves were succulent, and the batter was not oily – and she was particularly enamoured with the wasabi mayonnaise, which she described as “different” and a great accompaniment to the shellfish. When it came to the main course, my decision was simple. Manager Kevin says that the trio of pork – Pancetta wrapped pork fillet, crispy pork belly and Bury black pudding with sage and garlic mash and apple sauce (£13.50) – is one of the most popular dishes on the new menu, and it’s easy to see why. All of the meat was beautifully cooked: the belly with a layer of perfect crispy but chewy crackling, the fillet still tender and the huge pieces of black pudding lovely and crumbly. The creamed spinach was a welcome addition to cut through the expected saltiness of the dish, and I’m always glad to see crispy sage leaves on my plate, but I wasn’t that convinced by the texture of the mash. 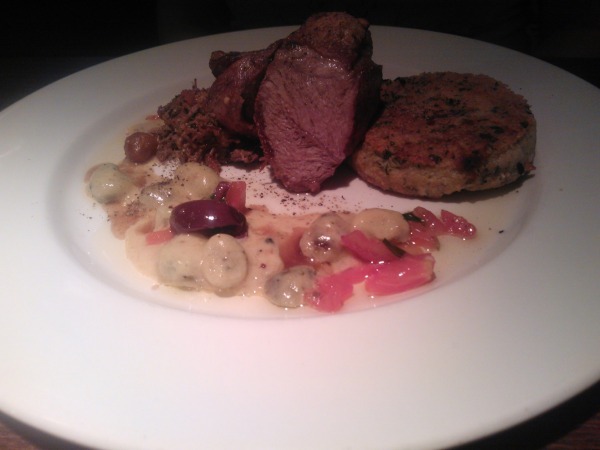 Laura’s roasted rump of lamb (£16.25) was a little more well cooked than she would have liked, but not to the extent that it was too dry. The layer of crispy lamb fat on the outside was raved about, and the rich shards of pulled lamb shoulder were a welcome addition. She wasn’t convinced, however, by the pureed broad bean patty that accompanied her meal, which was a little bland despite the addition of sage. 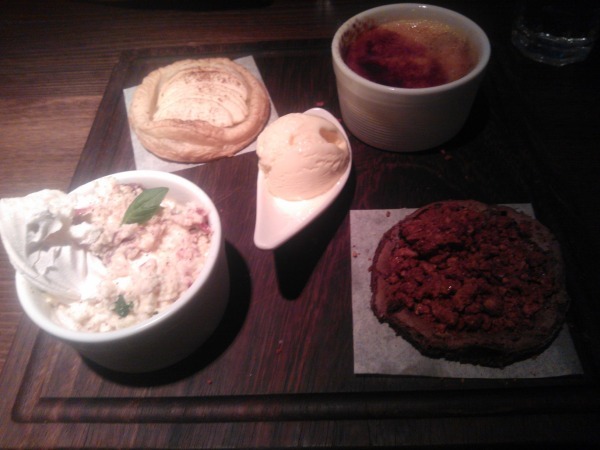 The sharing board of desserts (£12) was, without a doubt, the star of the meal. It’s an easy way to try a bit of nearly everything on the menu without having to make any decisions! 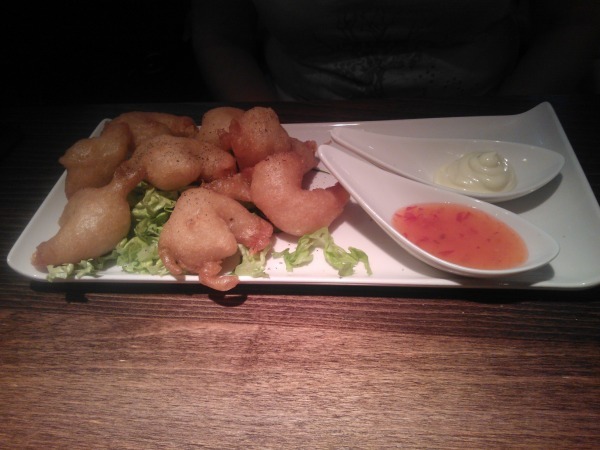 The one thing I would say is that sharing between two is not advisable if you’ve already had two courses…it was huge! The scoop of ice cream, although tasty enough, was a little redundant – we had plenty to keep us going with the other four dishes on the plate. By far our favourite was the “Basil Grande” Eton Mess – a dessert based on one of The Living Room’s cocktails. Meringue, cream, strawberries, basil and black pepper combined to make a dessert that may not have been all that pretty to look at, but tasted surprisingly good considering the seemingly bizarre combination of flavours. A decadently rich and gooey chocolate truffle cake was topped with crushed honeycomb-style “hokey pokey”, and an apple and cinnamon tart featured light, fluffy pastry and just the right amount of spice. Sadly, although the blackberry and crème de mure crème brulée was technically well-executed, the blackberry flavours could have come through a little more strongly. The mission to change Laura’s mind about The Living Room, I think, was successful – cemented particularly by the dessert. Still a few niggles here and there, but the service was excellent and the food, on the whole, pretty good. As with our last review, neither of us was completely blown away, but it’s a solid choice for a night out for groups big or small. Genuinely glad to hear it has improved, we went there with work once and it was actually one of the worst meals I've ever had. I ordered their thai curry which some how was devoid of spice, flavour and even coconut milk not entirely sure how this was possible! 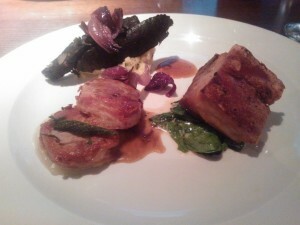 The pork you chose sounds really nice, I am a sucker for pork belly and sage leaves too! yum! Ok that dessert selection looks very very good, would do just for myself though! The cake looks like a cookie though! I think if you order the cake as a separate dessert it looks more cake-like…no complaints for us, though – apart from the fact that we couldn't finish it! You couldn't finish it…… Oh the shame!